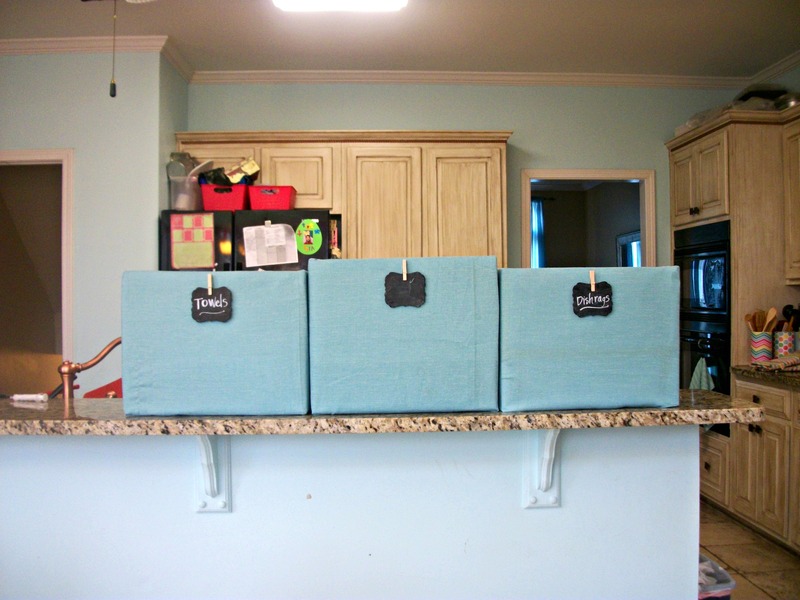 There are a zillion versions of DIY storage boxes out there in the blogosphere, but I thought I’d add one more! I have a lot of unused space above my kitchen cabinets that was begging to be put to better use. 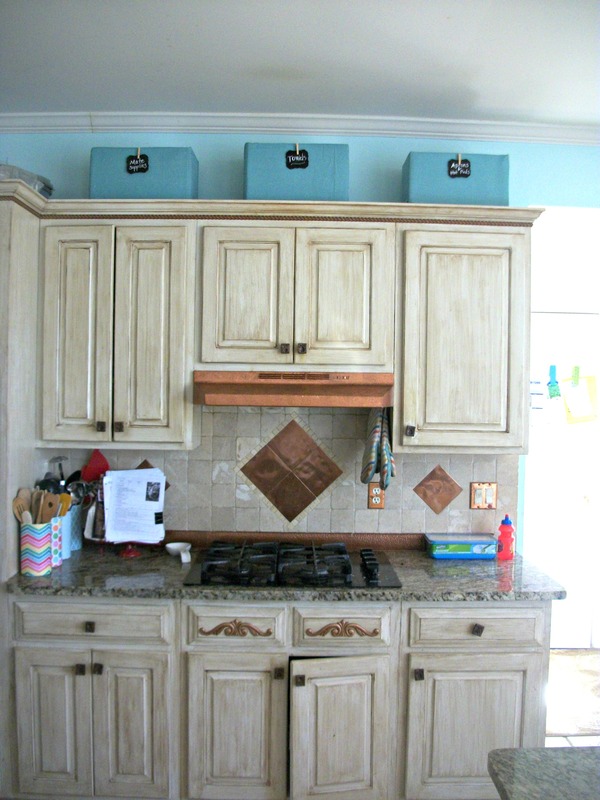 Of course, getting to the top of the cabinets is a pain, so I really only want to store things there that I rarely need. 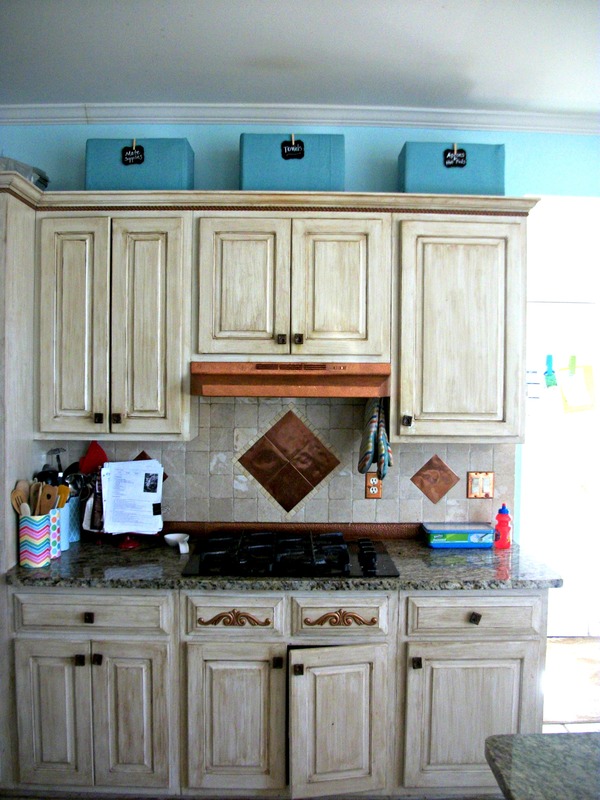 Also, the usable space on top of the cabinets is a little limited because of all the wood supports on top. So off to my trusty Costco to find a box that was tall, but no more than 12 inches deep. I found the perfect boxes, but they had an open front. Easily solved by adding in a piece of cardboard cut to fit. I used hot glue for this entire project, including gluing the cardboard into place. The fabric that I had on hand to use to cover these boxes was very thin and so the writing on the box was showing through. To solve this problem, I just wrapped the boxes in white butcher paper. I wasn’t interested in having a “perfect” box. I was interested in having a box that fit in the space that I had and that looked like it was really nice, even if it wasn’t! 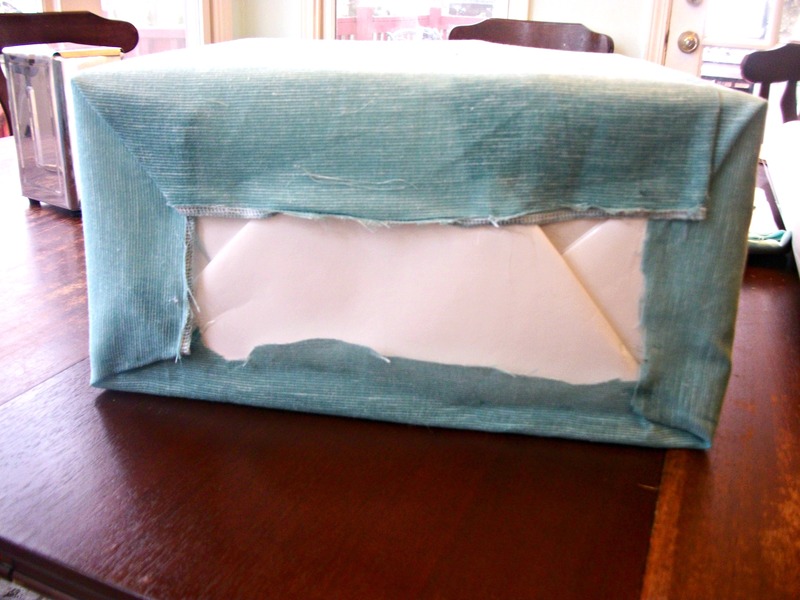 I hot glued the fabric around the base of the box. Then, I pulled the fabric taut and hot glued it on the top. I folded the fabric under to create a neater inside top, although this wasn’t really necessary for my use. To give it a little fun flare, I used mini clothespins to hold chalkboard labels. Again, I used hot glue to apply the clothespins. After I finished the boxes, all I had to do was figure out exactly what I wanted to put where. I thought that all three were the exact same size, but as you can see, one was slightly taller, but I just put it in the middle so it looks like I meant it to be that way! The top of my cabinets had a layer of grimey dust on top, so I figured that after a while, my boxes will get grimey dust on them, too. I really didn’t want the stuff that I am storing to be ruined, so I just laid an extra piece of cardboard cut to fit the box and laid it on top of the stuff inside – essentially creating a makeshift lid to keep dirt out. I was so excited to put that empty space to good use! And up there, no one can see that they are just cardboard boxes held together with hot glue!